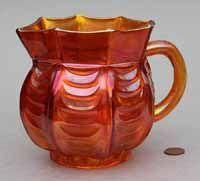 Membership of a Society of like-minded people, who are passionate about collecting, spreading awareness, and appreciating the beauty of carnival glass. Four 40-page Newsletters per year, which include a diverse range of articles - from those which are educational and well researched, to accounts of intriguing new finds from our members, to snippets of news and reports of forthcoming or past events. Education and Friendship has been the foundation of the Carnival Glass Society over the past 35 years. Membership allows you, not only to learn about the glass, but also to make friends with, and learn from other collectors from around the world. The Carnival Glass Society has been donated an exceptional collection of European, American and Indian carnival glass by Anthony and Maureen Ward that will be showcased and shared through the Newsletter, at exhibitions and in other global forums as part of our 'Let's Get Physical' programme (aimed at spreading awareness of carnival glass to a much wider audience). Members can contribute and be part of this exciting new project. Invitation to CGS organised events and Gatherings or Get-togethers at members' houses throughout the year. Attendance at the Society's Annual Carnival Glass Weekend, held each September, with lectures / talks, sales of carnival glass, display of members' glass, raffles, evening dinner, entertainment and much more. The Carnival Glass Society UK has negotiated discounted admission charges with the organisers of some of the largest antiques and collectors fairs in the UK. Two members of the Carnival Glass Society (or one member + guest) can attend each participating fair for the price of one admission ticket on production of a CGS 2-4-1 discount card. The discount card can be used on over 80 fair dates at 10 locations across the UK with significant savings available. Access to the Carnival Glass Marketplace in the Members Area of our website where members list glass that they would like to buy or sell . Alternatively, you can join the CGS electronically, by visiting the Webstore, selecting the type of membership you require, and then link through to PayPal. Membership renewals can be made either electronically here , using Paypal or alternatively, cheques should be sent to The Membership Secretary, 13 Meadway, Upton, Wirral, Merseyside CH49 6JG. Click here to make other payments / donations to the Society, using Paypal. Your privacy is important to us so if you join the Society then please be assured that we will keep your personal details secure and only collect the information that is required to provide you with the excellent services which the Carnival Glass Society has to offer. To find out more about how we manage and respect members’ personal data please read our Membership Privacy Notice or contact us on pedenmore@gmail.com to request a printed copy. If you have any questions about how we handle your information then please ‘contact us’ on pedenmore@gmail.com. Treat them to a Gift Membership of the CGS.